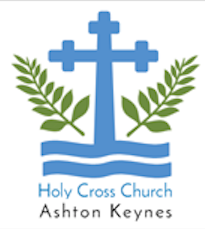 Here are some examples of School-Church Links between Ashton Keynes C of E VC Primary School -and Holy Cross Church Ashton Keynes and All Saints Church Leigh. Governors: Revd Dr Shirley Danby (ex officio), David Tarr (LLM Emeritus) and Meggen Cantillon are foundation governors and we have three further governors from Holy Cross community. Open the Book team: A Churches Together team (C of E and RC) come in for Open the Book, 3 Friday mornings most months. The team shares dramatized Bible stories in collective worship. Each class takes a turn with helping to tell the story and a small group of children lead the prayer. 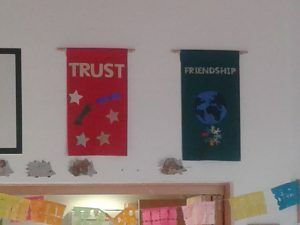 Prayers for the school: Pray-ers from Holy Cross church Ashton Keynes and All Saints Church Leigh congregations pray for the school as part of intercessions and a prayer network and group prays in response to need. All children come and in small groups learn from the activities and reflection time. Holy Cross church gives each of our year 6 leavers a copy of “It’s Your Move” (Scripture Union) to help them in the transition to secondary school. The children explore what’s in the book one half day before the end of term with a member of the church team. 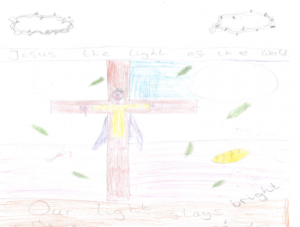 A Leavers Service is a new initiative for us and is held in Holy Cross church, led jointly by the headteacher, Sam Saville and Rev’d Shirley, thoroughly involving the Year 6 pupils and members of the church community. 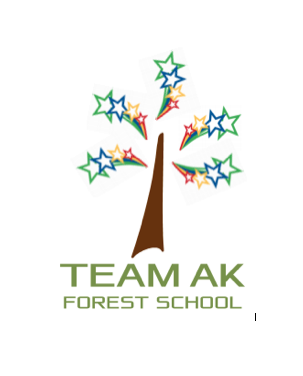 It’s a very special time and we pray for God’s blessing on all children and staff who will be leaving AKPS. School Worship Table reflects the Christian festivals and seasons and Holy Cross church provides the cloth for the worship table. The cloth colours are in line with church colours for the season). 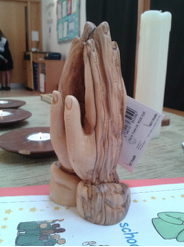 Holy Cross gave school the Praying Hands to mark Education Sunday and Mrs Saville came to the church worship. 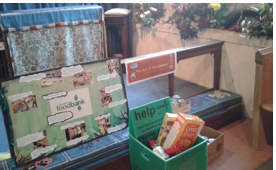 AK Messy Church uses the worship table too. Holy Cross church has instigated and manages a Youth Café after school on Tuesdays in term time for years 6 and 7. This helps maintain and grow connections with each other and between the church and young people. 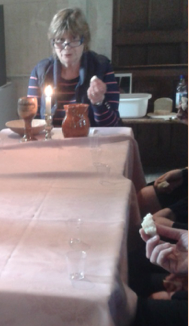 15 – 20 young people come regularly and it is held in the back room of The White Hart Inn. iSingpop was instigated by the Headteacher to further develop school and church community links and proved to be incredibly successful. Feedback from the community and parents has been wholly positive and many have asked for the return of the project. 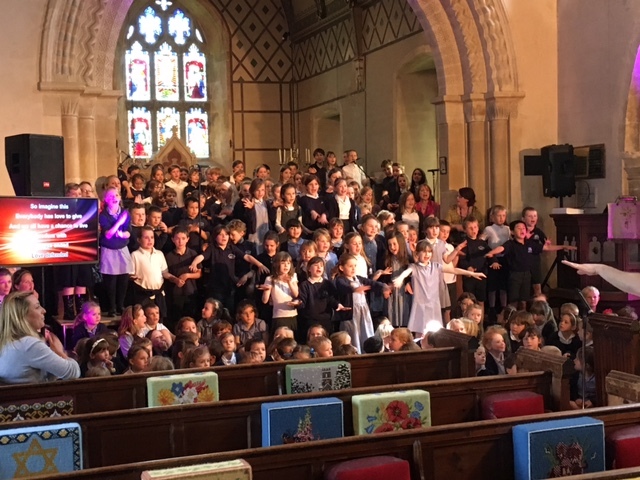 In school and church, the impact of iSingpop can be seen in the use of the praise music in all worship and how it brings together the community in active praise. The two concerts were held in Holy Cross church and the church community and parents LOVED it. AKPS have given church a CD of the songs which they use at services and at AK Messy Church and JAM at Leigh church. 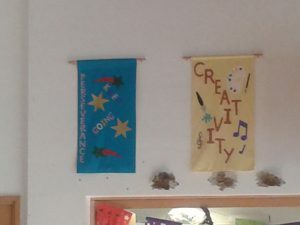 School children make notices which are displayed in the church. Revd Shirley meets with Worship Council and they help her plan services in the church. Some of the Open the Book team came to help class 2 understand more about the Easter story and what it means to them. The children asked lots of questions. 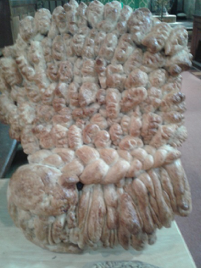 Some of the Experience Harvest team helped class R make 2 beautiful harvest loaves. 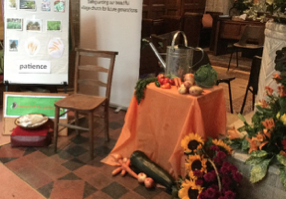 One was used in Holy Cross church for their harvest festival service. 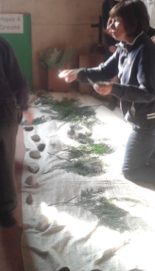 Children regularly and spontaneously create TeaSPoon prayers which are used in the services in church. 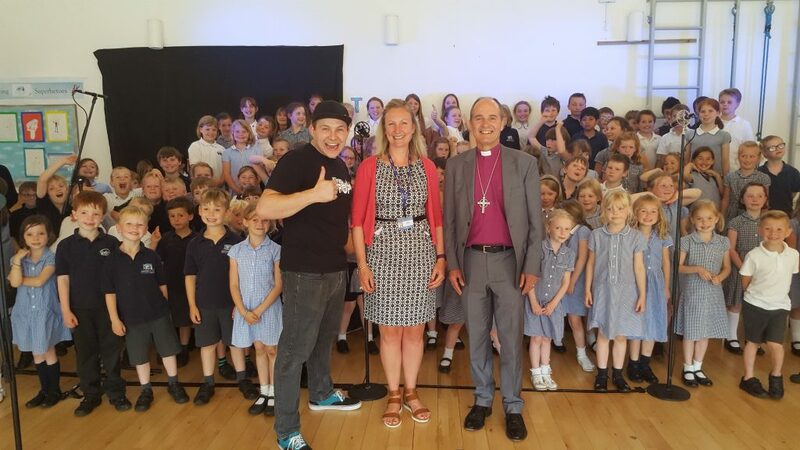 Revd Shirley invited Bishop Lee to come to our school and he was so excited to hear about iSingpop he came back to hear a performance and he loves the CD. At the Christingle service in Holy Cross, worship council planned it and many children from school came and we all enjoyed it. Lots of children collected money in the flame pots and together school-church raised nearly £300. We are so proud of the strength of our Church – School links that we are now preparing to go for a Church-school partnership award!